Miller IDS is excited to announce our March 2019 Artist of the Month, Connie Adcock with her piece, “Gemstone Guitar.” As we emerge from our (albeit warm) winter, we find our city filled with live music, smiling faces, and lots of perfect days to go to Zilker Park or hang out on the patio of a great restaurant. 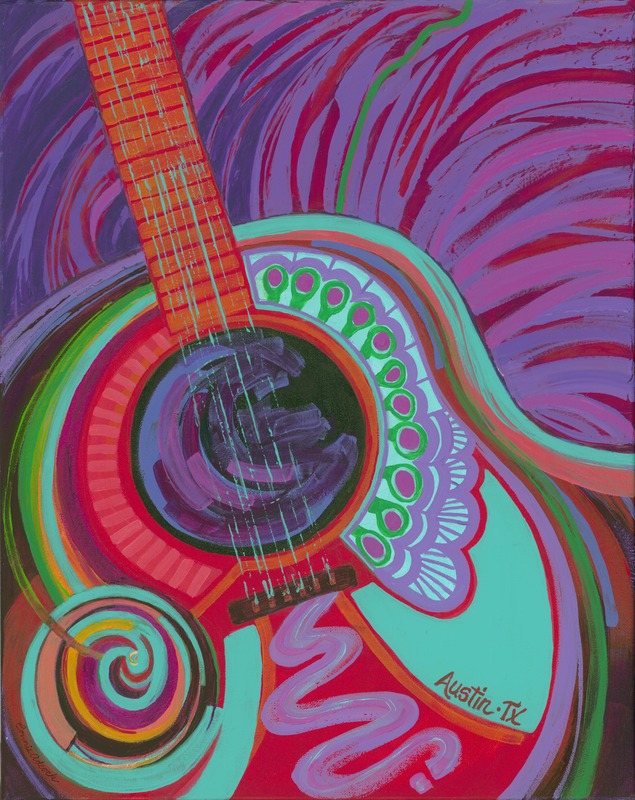 Adcock’s piece uses bright colors to bring to life the vibrancy of the Austin music scene and is drawn from her life here in the Live Music Capital of the World. We were so inspired by the content and the colors of “Gemstone Guitar” and how they reflect springtime in Austin. Formerly a first-grade teacher at Colorado Academy in Denver, Adcock retired in 2013 and made her way down to Austin. An art and education major in college, she had always used art during her teaching and now, in her retirement, Adcock focuses her time on creating art. 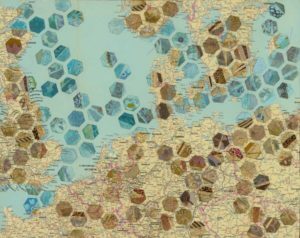 In her exploration, Adcock has used her fascination with colors and repetitions found in nature as well intricate imaginative patterns to bring her art to life. In the beginning of her work, Adcock took on a realistic tone by drawing inspiration from life experiences. In the past year, however, she branched out and is currently experimenting with a style that combines realism and the abstract. 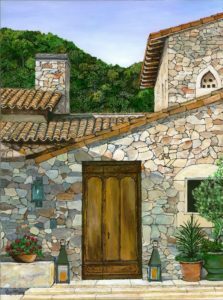 Currently, Adcock has original paintings in two galleries in Salado as well as Galveston, TX and prints of her work in various restaurants and gift shops in Austin and throughout Texas. Adcock’s inspiration for “Gemstone Guitar” is drawn from her love and experiences of live music in Austin. 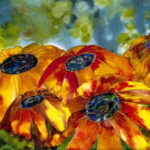 She immerses herself in the emotions of her paintings and expresses her joy and passion for her work. 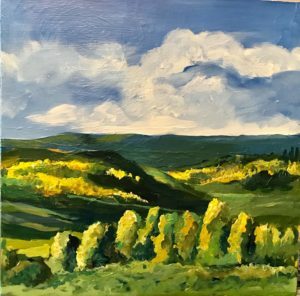 She notes that in her art, these emotions “run the gamut from thoughtful and introspective to exuberant and wild.” She paints with bright, vivid colors which reflect her cheerful, optimistic, and positive outlooks and stance to life and art. Adcock’s work is heavily influenced by her life experiences including traveling and new discoveries, memories from childhood, and her imagination. “Gemstone Guitar” reminds us of the bright flowers and greenery that appear in Austin during this time of year as well as the live music you hear throughout the city as the weather gets better. As the city comes alive, Adcock has captures the emotional outpouring of excitement and new projects that reverberate throughout Austin. 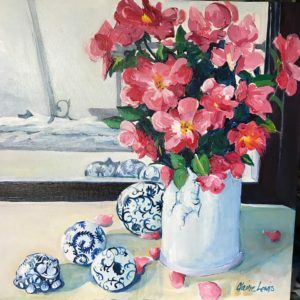 Thanks, Connie Adcock, for allowing us to feature you as our March 2019 Artist of the Month. You can find her work up in both of our stores now through March 31st and you can also see “Gemstone Guitar” on the windows of the Prima Dora Gift Shop next to Magnolia Café on South Congress Ave.
Austin Bergstrom International Airport (ABIA) is bringing the Austin cultural experience to all who stop by. The airport, just like Austin, is currently expanding to fit the growing needs of our funky, tech-based town by adding nine new gates and updating three existing gates. The new terminal will also feature an observation deck, a Delta Sky Lounge, and Austin-based restaurants such as 24 Diner, Toy Joy’s Yummi Joy, Parkside, Salvation Pizza, and more. As we (and the 150+ people who move here each day) know, Austin is a special place with its own unique culture and vibe. Everyone who visits gets to experience that funky, but updated, Austin feel in the expansion and face-lift of ABIA. One company propelling that push forward is general contractor and construction company, Hensel Phelps Construction who has worked with ABIA since 2013. Although not Austin-born, the builder and contractor has worked hard to bring the Austin culture to our ever-expanding town and airport. The expanded terminal was inspired by Texas dance halls and the Austin Moontowers. For the past few months, Miller IDS worked with both Hensel Phelps and the Austin-based artist, Mila Sketch to bring new, vibrant and modern art to ABIA. Hensel Phelps is proud of its Hensel Phelps Way. For them it is a collaborative approach that blends proven processes, innovative technology, and effective communication throughout every phase of the project lifecycle. 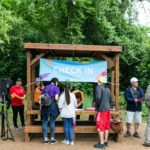 Hensel Phelps worked with Austin-based, Russian-born artist Mila Sketch to bring her exciting and award winning modern- environmental art to ABIA as a continuation of the City of Austin’s Art in Public Places initiative. 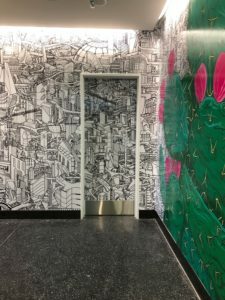 The piece, “Urban Nature,” was drawn free hand on panels and feature recognizable Austin buildings as well as futuristic buildings we could maybe see in the future. The space in front of her mural will be a rotating selection of art as selected as part of the City of Austin’s Art in Public Places initiative.An incredibly accomplished artist, Sketch has produced many memorable murals you might have seen around Austin including Austin Howdy (on West 6th St), Austin Beat (at Encore Records), and These Walls Bring Us Together (between 4th and 5th streets at I-35). Sketch has also produced art for the Austin Parks Foundation, Ramen Tatsu-ya, CLIFF Bar, Google, SXSW Festival, Mazda USA, X-Games, Lifeproof and has won several awards throughout the US. 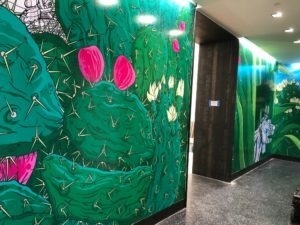 Sketch first brought her art to Miller IDS’ Fine Art Specialist, Dana Burton, who took special care and 2 months to scan and color match 32 40″x 92″ panels. 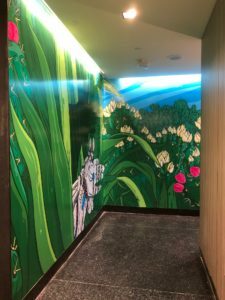 When the printed panels were not ready in time for their installation from another company, Miller IDS swiftly came in and printed and installed a solution using vinyl. You can view and enjoy the vinyl panels in the new terminal of the airport. We look forward to getting to go on a trip and see Hensel-Phelps and Sketch’s collaboration to bring more art to ABIA. 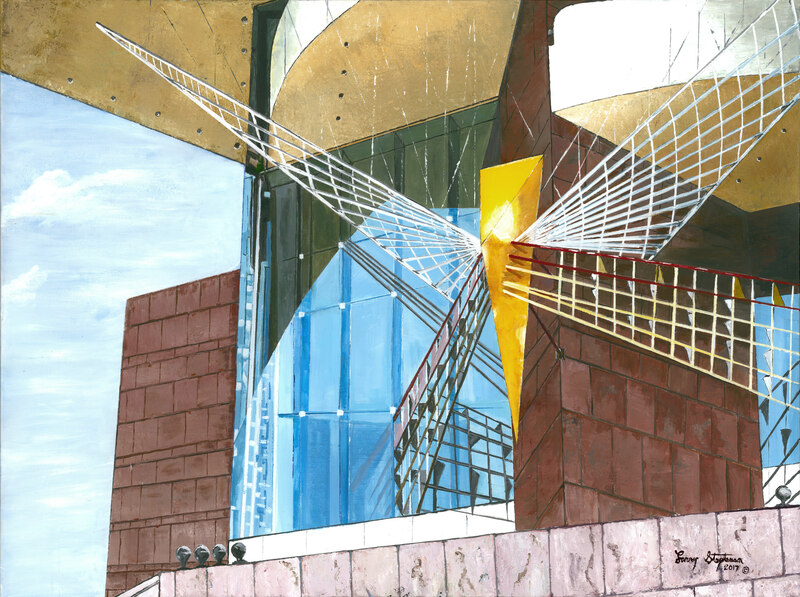 Miller IDS is honored to announce our February 2019 Artist of the Month, Larry Stephenson Sr. and his piece, “Firebird.” Founder of Green Builders and CEO of Green Design Builders Inc, Stephenson uses his knowledge of and passion for architecture and design to enhance the viewer’s understanding and absorption of his work. 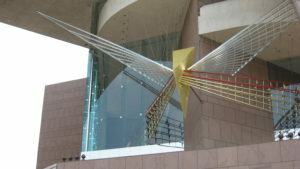 For “Firebird”, Stephenson was inspired by the “exquisite architecture combined with magnificent sculpture” of the Segerstrom Hall in Costa Mesa, CA. This building so moved Stephenson that he notes it “pulled at [his] soul to unleash the enhancing of the colors and brilliance in which [he] sees.” Stephenson has worked with Miller for 20 years and continues to bring us incredible thought-provoking art. The piece is available to view at both of our locations through the end of February. You can contact Larry Stephenson at lessr@earthlink.net. 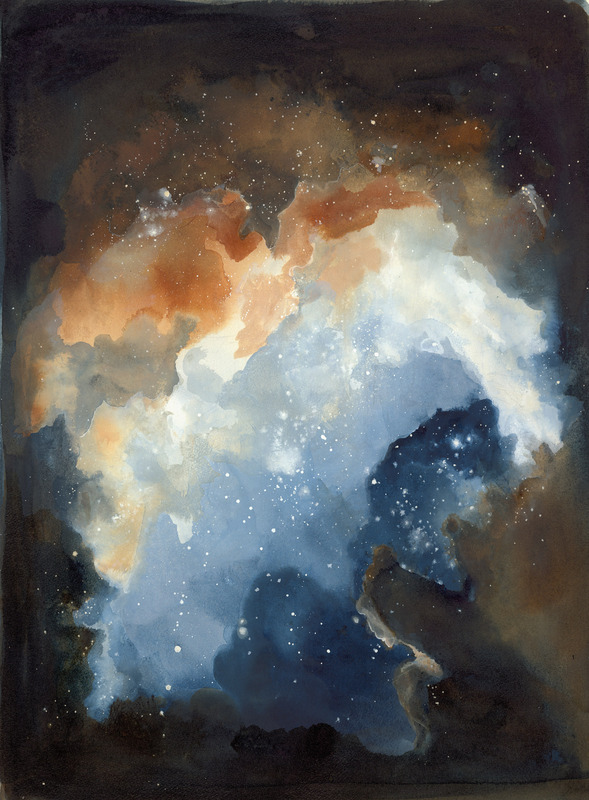 Miller IDS is proud to present our first Artist of the Month for 2019, Adrienne Hodge with her piece, “Suspension.” The piece prominently exhibits Hodge’s interest in astronomy, quantum physics, and the forces that drive our universe through the subject matter of space. A graduate from UT Austin in 2010, Hodge has taught in Dripping Springs ISD, Leander ISD, Round Rock ISD and is the co-founder of the Moon Gallery & Studio in East Austin. She also teaches adults art classes at the Dougherty Arts Center. A native to Houston, Hodge ended up in Austin in the early 2000s when her passion for the visual arts became apparent after she arrived. While attending ACC, Hodge would wander into Miller Blueprint on 6th Street in between classes at the Rio Grande campus. Since transferring to and graduating from UT Austin, Hodge has broadened her style moving from portraits to focusing on atmospheres. She has continued to frequent Miller IDS, having many of her works scanned by our Fine Arts Specialist, Dana Burton. Hodge’s “Suspension” stems from her desire to create ethereal environments that pull the viewer into the work. This piece exhibits her artistic evolution as it observes her foray into intuitive painting through the subject matter of the stars and Hodge’s contemplation of her place among them, while also exhibiting her imagination. Hodge notes, “For years, I explored portrait work with space-themed and often symbolic or surrealistic backdrops. In the last year or so, I began shifting my focus to the backgrounds in my portraits as my primary subject matter.” Although she has sold the original to a private collection during the EAST Austin Studio Tour in November 2018, prints of the piece are still available for purchase through her website. “Suspension” is available to view in both of our stores now through the end of January. Adrienne Hodge can be contacted through her email (AdrienneHodge@gmail.com) or through her website (www.adriennehodge.com). It all started in 7th grade shop class, Chris Harman planned and built a functioning chair for his wood project. 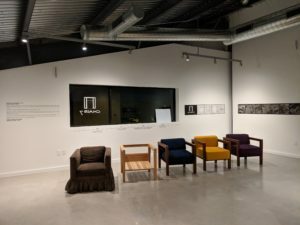 Now, many years, kids, and a move from Houston later, Harman has updated his original design to produce a classic and elegant chair manufactured in East Austin. 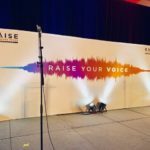 Harman worked closely with both Ryan Bruce, Miller IDS’ Graphics Account Manager, and Micah Frugia, Miller IDS’ in-house graphic designer to create several vinyl wall decals that detailed the chairs creation and Harman’s biography. Although the first chair was created in 1979, Chair 7 continues to show the sleek sophistication of Harman’s original design. Chair 7 became a project again after attending a UT Architecture class one summer, he decided to combine his passion and business acumen eventually leading to Chair 7 today. Miller IDS is glad to have such an incredible work of design just down the way at Springdale General. He’s updated the original design, slightly: modernizing the overall look, to bring a polished, comfortable chair that will be a warm and inviting addition to any home or office. The chair was named after when it was originally constructed, whereas the logo for the chair is an homage to those original offset legs. 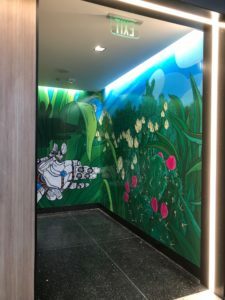 Miller IDS helped bring Harman’s furniture creations from visual concept to completion in several different wall decals that highlighted Harman’s design. 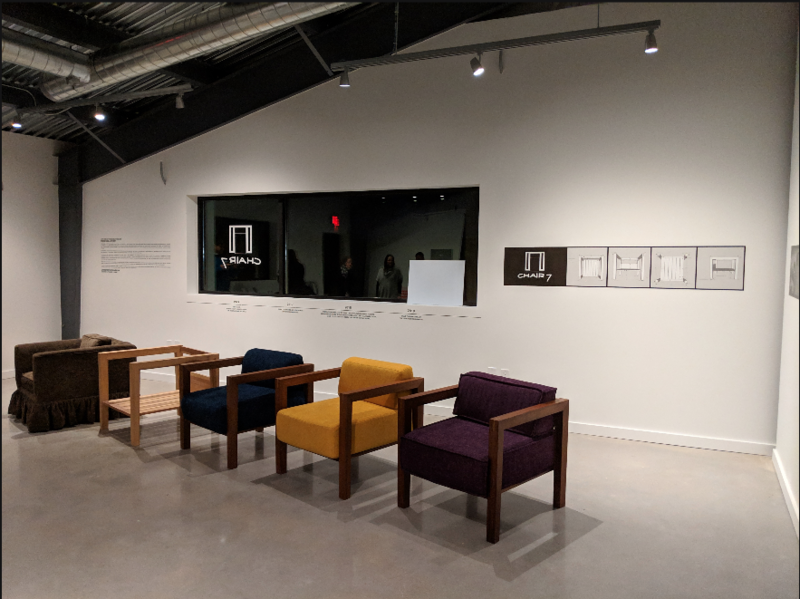 Both Ryan and Micah worked with Harman to create a museum-style studio wall vinyl that accentuated the timeline of the chair, a biography, and other wall decals right in time for the EAST AUSTIN STUDIO TOUR this past November. We love working with designers and artists to help create a place to showcase their incredible, passion-filled work and backstory. Call (512.478.8793) or email (info@MillerIDS.com) for a custom quote to infuse your unique style into any space. Miller IDS is proud to announce Ashwara Pillai with her piece, “Under the Tuscan Sun” as our November 2018 Artist of the Month. An Ann Richards School (ARS) senior, Ashwara’s creative side has prospered since she was young. 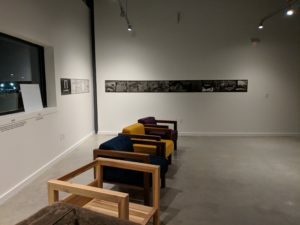 Now at 17-years-old, Ashwara just completed a solo exhibition of 60 pieces at Imagine Art, a space where artists both with and without disabilities can practice and exhibit their art. Miller IDS is honored to feature this young artist from ARS. Next fall, Ashwara plans on attending college and majoring in design. We are proud to feature a future graduate of ARS and wish her the best of luck in all her future endeavors! With the holidays fast approaching, remember that scans and reprints of personal artwork and family photos make incredible gifts for loved ones and friends! Contact Dana Burton (FineArt@MillerIDS.com) for further information. Miller IDS is proud to present our September and October Artist of the Month, Texas born-and-raised, Claire Lewis. Formerly of the Fort Worth area, Lewis now lives in Central Texas where she draws much of her inspiration from the natural world around her. Lewis honed her skills through formal study at various University of Texas System schools and eventually received both a BFA in Painting and a BS in Art History from the University of Central Florida. 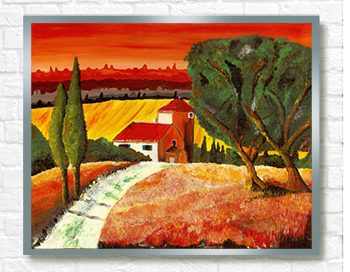 Both a figurative and impressionist style painter, Lewis focuses predominantly on the observations of life and nature. Particularly, in her work, Lewis captures the glimpses of life that make her curious, smile, or laugh out loud. The piece we feature this month, “Mr. Tran’s Scissortail,” shows the bird in a moment of flight in a field of wheat. 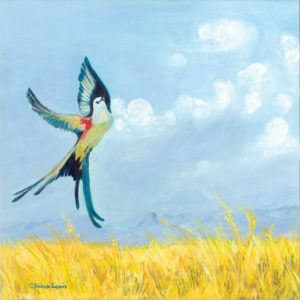 In her work, Lewis is drawn to both avian flights that portray elation as well as grounded moments of quiet pensiveness. The paintings Lewis brings to Miller IDS exemplifies how she approaches her subjects by capturing them in brief moments in time. Birds are prominent throughout her work and this scissortail is no exception. You can find more of Lewis’ work on Facebook or at various venues around Texas. Currently a member of the Live Oak Art Center in Columbus, Texas, this fall Lewis will teach a children’s art class of found art. To view more of Lewis’ work click here or contact her at lewis.claire5@yahoo.com. Miller Imaging and Digital Solutions is proud to present the August 2018 Artist of the Month, Susannah Blanton and her piece The Beginning of the Beginning. Originally from Fort Worth, Blanton was heavily influenced by the creative spirits of her parents who exposed her to all forms of art. 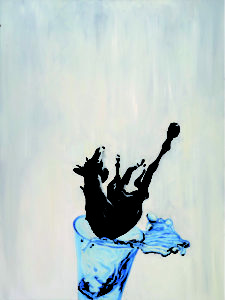 Blanton’s work also has great influence from the LA Artist community social commentary during the early 2000s. 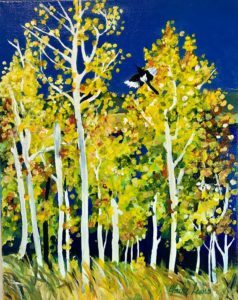 In her work, Susannah Blanton views painting as a medium to illustrate a message and tell a story. Specifically, in her collection, The Beginning of the Beginning, Blanton highlights the fragility of human life and is the expression of Blanton’s own grief. The collection and our chosen piece uses several symbolic elements to describe Blanton’s grief and coping of the loss of both her mother and brother-in-law. The use and power of water, horses, and vintage advertisements aid Blanton in describing the loss of control one feels throughout life. Spilled water is an incredibly powerful image, as to Blanton water “[is] a symbol for death and/or the voyage into the afterlife.” Within the piece, she attributes “the vulnerability depicted in the falling horse [as a reminder of] how fragile life can be.” To Blanton the “piece establishes the symbolism for most of [her] subsequent work, where water came to represent the afterlife and horses represent us in the physical body.” The chosen piece, featured right, explores much more than the literal but the fragility of the human experience and the lack of control humans have throughout life. An example Blanton’s work exhibiting the influence of an vintage advertisement. 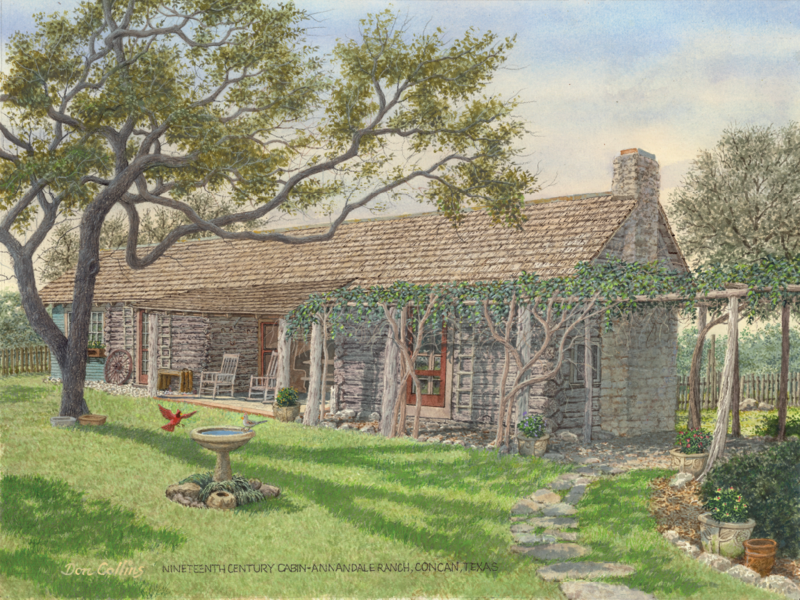 Come by either of Miller’s locations to see a reprint of Susannah Blanton’s The Beginning of the Beginning now. View more of Blanton’s work here or contact her at blantondesign@me.com. 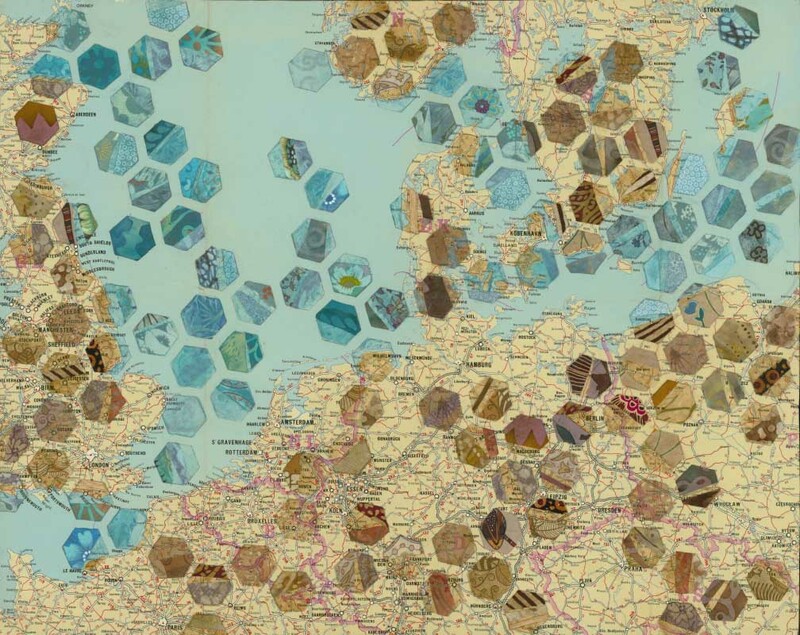 Angela Diehl earns a living as a medical illustrator but has always had a fascination with maps and a love of fabric and quilting. Diehl pursued a biology degree, but her work never lingered far from incorporating her interest together. Her background in traditional painting and biology gives her a unique view of the world and power within her work. She specializes in traditional art and digital multimedia with a specialty in scientific, medical and biological subject matter and has worked on a wide variety of educational materials. Her illustrations and multimedia have been provided for peer reviewed articles, grant applications, teaching materials, and websites. Check out Diehls work here or email her at diehlang@gmail.com.